In this series of articles we'll write about one or more Mario game every day for 30 days, each representing a different year as part of our Super Mario 30th Anniversary celebrations. Our original plan for our 2000 entry in this series was to write about Paper Mario, yet just recently we shared an editorial to celebrate its 15th Anniversary, so decided to take the opportunity to cover two different titles instead. These two games have the same name - Mario Tennis. We'll kick off with the N64 version which came first and continued the Nintendo 64's reputation for opening up multiplayer experiences. It was also the first 'main' entry in the franchise, as Mario's Tennis on the Virtual Boy is often regarded as separate from the core of the IP. Mario Tennis on the N64 continued the template of bringing in a range of characters from the Mario IP, and at the time there was a freshness to this début. Just like Nintendo's other spin-off sports or racing titles this one took a fun and slightly wacky approach, while attributing different mechanics to varied characters. There was the usual all-round Mario and powerful Bowser, for example, but the relatively large cast also delivered some skill players such as Boo, who could put ludicrous swerve onto shots. Like a lot of N64 games it looks relatively rough by modern standards, but even in the modern day it can be fun to play.The great appeal for many is in multiplayer, and with variable court services and some optional Mario-style rules there's plenty of scope to shake up matches. Choosing Mario at least once is a must, too, courtesy of the pointless but humorous option of running around when celebrating a point. Mario Tennis on Game Boy Color arrived late 2000 in Japan - admittedly 2001 in the West - and was an altogether different experience. In terms of gameplay that's hardly surprising, as the N64 game was pushing 3D graphics and the humble GBC had to stick to more conventional pixel-based approaches. What the portable game lacked in visual oomph, however, it made up for in appeal. It's the portable game that's arguably aged better, as it features a single-player RPG mode that could truly sink its claws in. Players chose an avatar and began a quest to rise through the ranks, levelling up and customising their abilities to suit a chosen approach. Opting for power would reduce speed, while speedsters would have relatively weak shots, and so on. The player would also have to consider whether to use upgrade resources on their doubles team mate, with plenty of balancing to be found it order to progress. In addition the portable title offered multiplayer using a link cable with a buddy, and this was also a very early example of crossover content between portable and home console. 'Mario Minigames' could be unlocked by those with a copy of the N64 game and a Transfer Pak, adding a little more depth to the experience. Despite the title, though, Mario and company were very much secondary in the portable title. The depth and addictive nature of that solo RPG campaign means that it's a Game Boy Color title that's remembered fondly by plenty of gamers. The Mario Tennis series hasn't been particularly prolific following these originals. 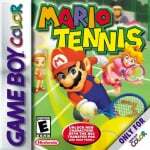 Mario Power Tennis came to GameCube (plus GBA) and had a Wii remake, with Mario Tennis Open arriving on 3DS. This generation will be well served (apologies) once Mario Tennis: Ultra Smash arrives on Wii U this year. This was a good game, and still fun today. I like Mario Power Tennis (GameCube) better, though. I heard the 3DS one was a disappointment. I'm not expecting much from the Wii U version coming soon. So no Mario Golf 64 article? Yeah, the introduction of Waluigi NEEDED to be mentioned. I liked taking my 4 characters from the GBC onto the n64, via transfer pak, and improving their stats. The cross over was really fun and seeing their 3d models on a big screen was great. @Yellowkoopa I came in to ask that same question. I enjoyed the story mode to the handheld Mario Sports games. It made the solo nature of the experience better. Plus you were able to transfer yrou characters over and play with them on the 64 if memory serves. You chose to skip Paper Mario?